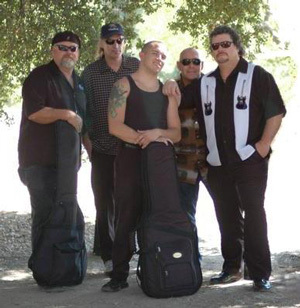 Michael John, Founder and President of the Ventura County Blues Society, is also the Founder of the Ventura County Blues Festival and leads his band The Bottom Line. Since the festival’s inception, Michael John & The Bottom Line have performed and donated their music which now has become an annual tradition for the festival kick off. When you combine family and lifelong friends you get a special musical bond that touches the hearts and souls of all music lovers alike. The band consists of Michael John (lead singer, guitar, harmonica), Michael John’s son Mikey Mo (lead guitar), Steve Nelson (electric, stand-up Bass), Eddie Z (tenor, alto sax), Jeff Dellisanti (tenor, baritone sax), and Tom “T-Bone” Broderick (drums, backup vocals). The group attracts people of all ages with their blend of Swing to more contemporary rocking blues. They have received national airplay and have won multiple awards including placing in the top ten bands in the finals for the International Blues Challenge in Memphis Tennessee. Michael was awarded the All Access Magazine award for best male vocalist.